Additional tasks from meeting with NISA et al this morning. Lower prirority than the Cabinet level issues we just discussed on the phone, but any responses available by 1800 EDT on 3/22 would be greatly appreciated along with an estimate of when the remainder may be expected. If you need additional info, please identify any questions we can bring back to NISA (keeping in mind please that their plant data is also very limited, i.e., keep your data expectations modest). 1. Sea water injection continues to reactors 1-3. NISA is concerned about the radiolytic disassociation of H2 and 02. NISA would like NRC‘s perspective on the significance of this concern and how to treat this concern as they transition to freshwater injection. 2. At what point does salt deposits become a problem for flow during pending freshwater injection? 3. NISA is conducting simulations to project the extent of damage to fuel in the reactors. Has NRC developed any views on the extent of fuel damage? 4. NISA is interested to obtain any reference material regarding core-concrete interaction (not because they think they have a current issue but against that eventuality) including the conditions under which that occurs and any associated data. 5. 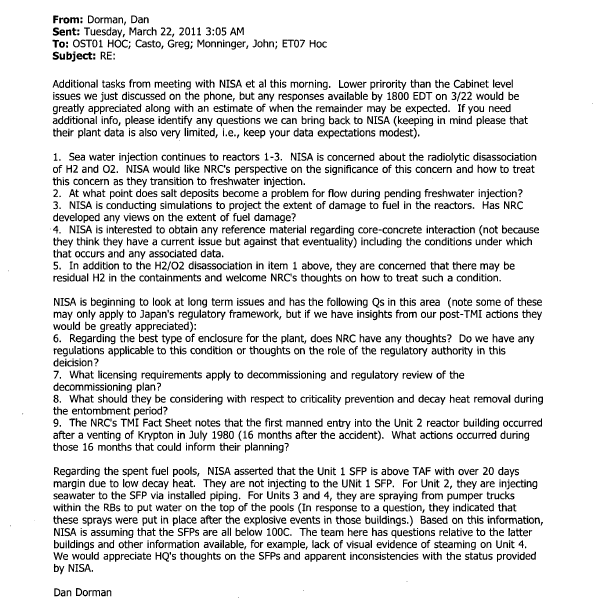 In addition to the H2/02 disassociation in item 1 above, they are concerned that there may be residual H2 in the containments and welcome NRC’s thoughts on how to treat such a condition. 6. Regarding the best type of enclosure for the plant, does NRC have any thoughts? Do we have any regulations applicable to this condition or thoughts on the role of the regulatory authority in this deicision? 7. What licensing requirements apply to decommissioning and regulatory review of the decommissioning plan? 8. What should they be considering with respect to criticality prevention and decay heat removal during the entombment period? 9. The NRC’s TMI Fact Sheet notes that the first manned entry into the Unit 2 reactor building occurred after a venting of Krypton in July 1980 (16 months after the accident). What actions occurred during those 16 months that could inform their planning? Regarding the spent fuel pools, NISA asserted that the Unit 1 SFP is above TAF with over 20 days margin due to low decay heat. They are not injecting to the UNit 1 SFP. For Unit 2, they are injecting seawater to the SFP via installed piping. For Units 3 and 4, they are spraying from pumper trucks within the RBs to put water on the top of the pools (In response to a question, they indicated that these sprays were put in place after the explosive events in those buildings.) Based on this information, NISA is assuming that the SFPs are all below 100C. The team here has questions relative to the latter buildings and other information available, for example, lack of visual evidence of steaming on Unit 4. We would appreciate HQ’s thoughts on the SFPs and apparent inconsistencies with the status provided by NISA.